Sometimes you set out to capture something that’s beautiful, with intentions of putting your signature on it. Well, I know that I do anyway…but this particular evening, anything I seemed to try to do that would make this shot more poetic, more impactful, or more unique…just seemed to take away from its natural beauty. 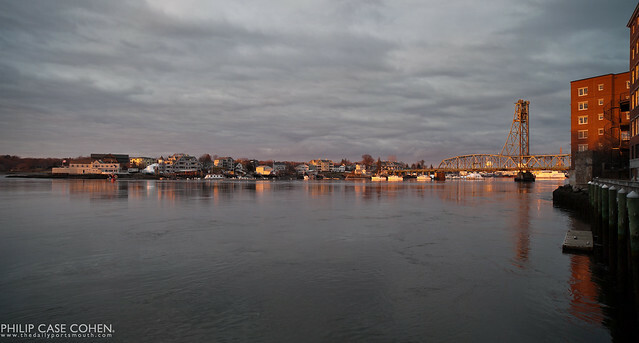 Be sure to view this one large (by clicking the image), so you can enjoy the spiral staircase off to the right, the construction at the Martingale Wharf as it nears completion, the perfectly orange homes on the Kittery waterfront, and of course the Memorial Bridge. I would like to purchase three prints to be displayed together in my home. I was wondering if you had any suggestions for three prints that you feel would work well together. My husband and I grew up near Portsmouth and would like to be reminded of it’s beauty every day. You do such amazing work that I am having a difficult time deciding which prints to purchase.